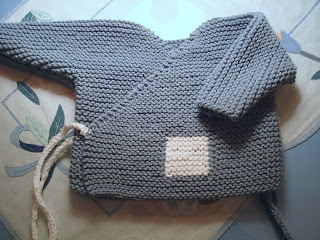 It's the Heartbreakingly Cute one piece baby Kimono from the first Mason Dixon Knitting book. I added little white squares for trim. There are about a million version of this little jacket on Ravelry. This was made for the impending son of friend. 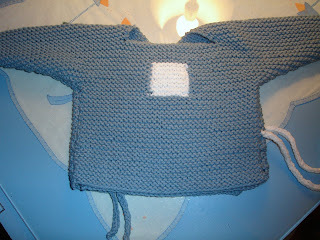 The size given in the pattern is for newborn, but my gauge was slightly larger, making this appropriate for a plus-size newborn, which this boy looks like being. I used a bit over one skein of Lion Brand Cotton Ease in the color Lake, a muted medium/light blue. I also used a few yards of Cotton Ease in white. Both are stash yarns. I used a size 5 needle in garter stitch. Next post - some sock drama. Please spare a thought on this day of thanks for the hostages and other victims of the terrorist attacks in Mumbai.